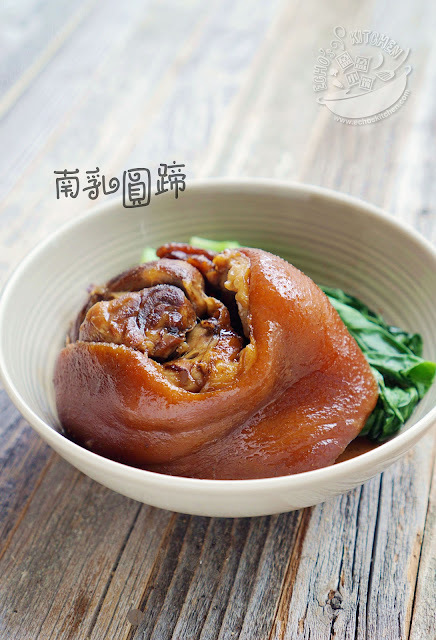 There are only so many trotter dishes in Chinese, mostly called for simmering in sweet soy sauce for a long period of time until the trotter becomes completely soft and tender. This particular recipe uses fermented tofu instead, it gives a very distinctive fragrance and taste. I made this dish for our Christmas party the other day, when served with the steamed buns brought by a friend, it was irresistible and everybody loves it! 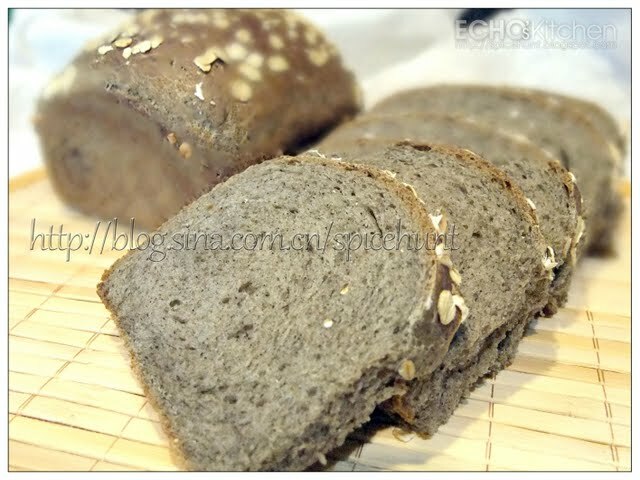 Black glutinous rice is a very nutritious wholemeal widely consume in Asia. It has good amount of protein, carbohydrate, calcium, phosphorus, iron, vitamin B1 & B2 ect. The Chinese herbal medicine books also believe that black glutinous rice could aid in increasing blood and its circulation, it could also helped in preserving or to increase "qi" or energy. This beautiful grain is normally made into sweet dish in south east Asia. This sweet porridge is one of them! Its holiday season and my loving neighbors were sending food to us one after another. It was cheese cake and muffins yesterday and famous New york Levain Bakery's cookies for Santa today. I am always lucky to have lovely neighbors wherever I go, they are there whenever I need something,and whenever I need some help! 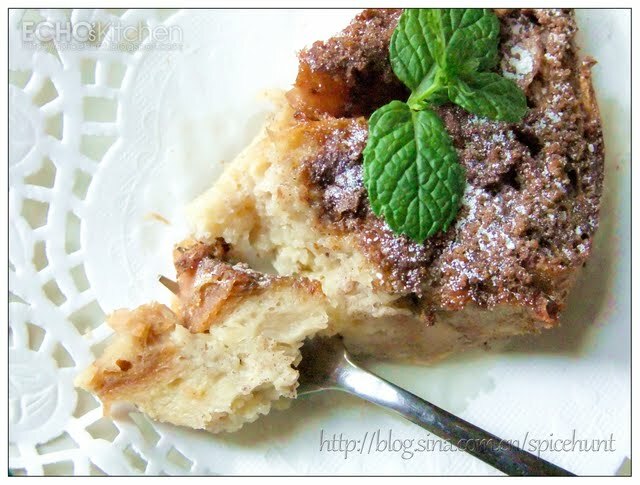 So I decided to bake a simple warm dessert as return of favor! Spanish Mackerel is something I grow up eating a lot. It is found in markets in Malaysia all year around, fresh and economical. 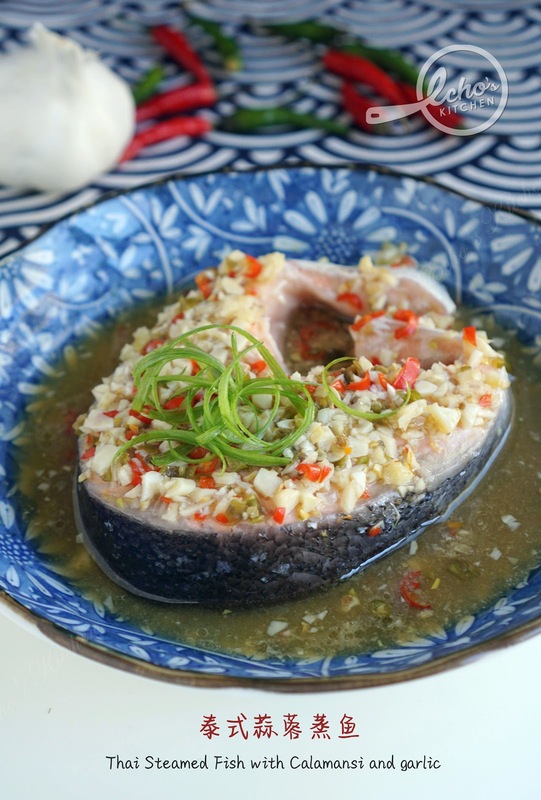 This fish can be prepared in many ways, it is tasty even as simple as pan fried until crispy and drizzle some light soy sauce, this itself made a wonderful side dish. I could eat it just like that and never got tired. I first tried this kofta in India, and was amazed by the taste. It went so well with flat bread, the kofta just melt in my mouth! This summer I harvest the Chinese bottle gourd that I curiously planted in spring, it flourishes and gave me two beautiful bottle shape gourds. I mean... really, coca-cola bottle kinda bottle shape... it was amazingly beautiful. I decided to use it for this dish, hubby's favourite. Every morning on work day in Kuala Lumpur, the capital of Malaysia. As working people rush toward the offices, with traffic moving at snail speed. The city awakes, and slowly get into busy mode. At the same time, at some obscure corners of all office buildings, you will always find some small breakfast stalls, with those who manage to reach office a little ahead of time, lined up for a quick fix for breakfast and the stall owner busy packing a variety of simple fried noodles/rice and some sides such as fried egg, luncheon meat, chicken nuggets, fried sausages. This simple, economical breakfast serving thousands every day in the city I once called home. Never failed to satisfy those hungry stomachs. God bless that city and its people! This Nyonya dish is one of my favourite chicken dish, it is spicy, and goes extremely well with rice! Washed the thigh and toast it in a pan until grease come out, cut onion, tomatoes into pieces and slice chilies side wise. Add the paste and cook together with chicken for about 5 minutes, and add all the powder but salt in, stir and cook for another 8-10 minutes. Now add the kaffir lime leaves, stir, add on coconut milk and 2 cups of water, bring it to boil and then simmer at medium heat for about 20 minutes, add salt to taste, before serving, add the tomato, chilies and onion pieces. 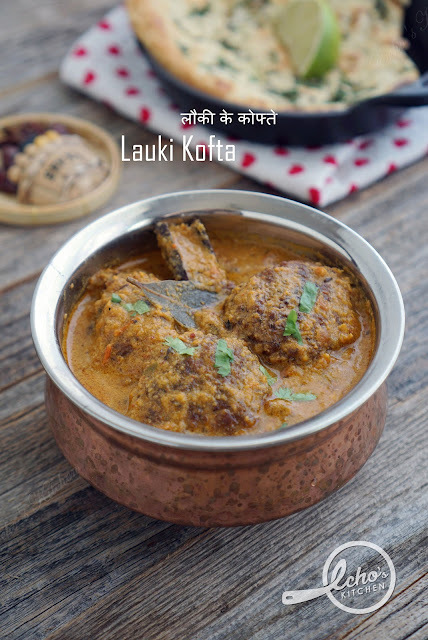 This delicious dish from southern part of India reminds me greatly of the famous Malaysian Curry -- Rendang. The taste and texture of chicken Chukka greatly resemble Curry Rendang, it too has very nice coconut fragrance. But the preparation is a lot easier, and somewhat healthier as it doesn't call for coconut milk.,the marinated chicken cooked slowly in spices until almost all liquid is gone and the final result covered with thick flavorful gravy. It is best served with steamed rice! In some cases, it could be a good starter and side dish! My friend harvest a few pumpkin recently and called me to pick up some. I went with expectation to bring back a cute little Japanese pumpkin. My jaw drops to the floor when I saw the said pumpkin that I was suppose to bring home! It must have been like 50 lbs or something... almost triple a basketball size! All I could think of at that point of time was... What the Hxxx! I backpacked to tour Europe during my last year in England. As a student, I had limited budget, thus was very calculative when it comes to food. I used to go to the local supermarket and bring back some cheese and bread, and that became my staple as long as it last. Over time it became dry, cold and tasteless, and I almost couldn't stomach it anymore, one morning at the shared kitchen in a Youth Hostel I put up for the night, I saw a beautiful Irish girl making this grill cheese sandwich, the aroma in the kitchen was so warm and welcoming. I immediately asked her to teach me and with little butter she generously lend me, I made this tasty warm sandwich with a cuppa hot chocolate... that was the first hearty breakfast I had during my trip and I felt like the happiest person on earth! 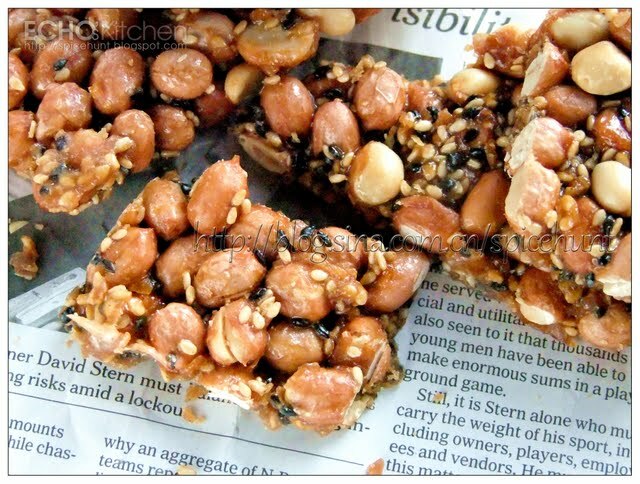 Peanut sesame brittle is a traditional candy I grow up eating and thought it exist only in China/Malaysia. I came to realized that I could not be more wrong later during my time in India. The Indians too, have a very similar version of this Peanut brittle, though slightly different in taste and ingredients. The recipe I created today is of the Indian style, I like the fact that it doesn't call for corn syrup/maltose, and I am a sucker when it comes to Jaggery! Just couldn't say no to the earthy smell and taste of it! I always keep a packet of frozen paratha in my freezer. It comes in very handy when I am either busy or lazy. The other day while chatting with a group of friends in a forum, one of the girl asked about a good way to use frozen paratha, and whether it could be turned into samosa. I loved the idea and set off to check recipes online and found handful of them... looks like we are not the first one to think it that way! I like my version of samosa filling, using homemade Malaysian curry powder, so here it comes my version of frozen Paratha samosa! In India, many families buy a big jar of fresh milk every day and boil it at home, they will save the cream on top of milk and keep it in a jar. 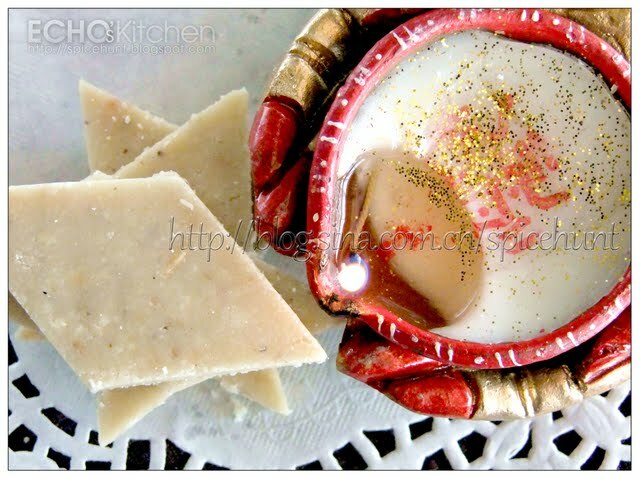 When the amount of cream in the jar reaches desired amount, the housewife will boil the cream in a heavy bottom pan or clay pot at low heat to slowly evaporate water content in the cream, the clarified liquid will be homemade ghee/clarified butter. The same method is being used in many countries in the world to preserve clarified butter. 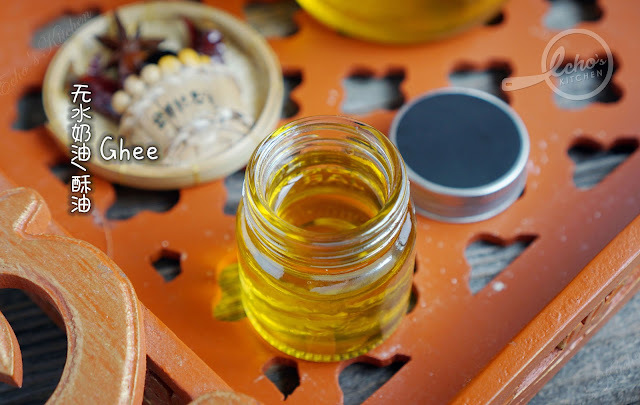 It is almost impossible to accumulate the amount of cream needed to make ghee at home nowadays, thanks to technology, we no longer need to pasteurize milk by boiling it at home. Here is the workaround method. Egg is a perfect choice when I am busy or have no mood for anything required more than 30 minutes to cook. This simple egg curry is quick, and goes well with steamed rice... very satisfying! Mum used to make a big bowl of Mee Sua soup (fujianese thin noodle) on our birthday. As it was specially prepared for the birthday boy/girl. It became all the more precious and tasty. It is my birthday today, and my mum told me to make a bowl of this noodle soup, as a sign of her love and blessing for me. It will be Diwali in less than 10 days, and I have been thinking of doing a Indian sweets series in celebration of this Diwali. This is the first sweet in my list -- Kaju Katli, I have no met a person who doesn't like the taste of this sweets, even with my not so sweet Chinese taste buds, this charming sweet's nutty flavour won me over the very first time I tasted it! Apam balik is a pancake with southeast Asian flair. 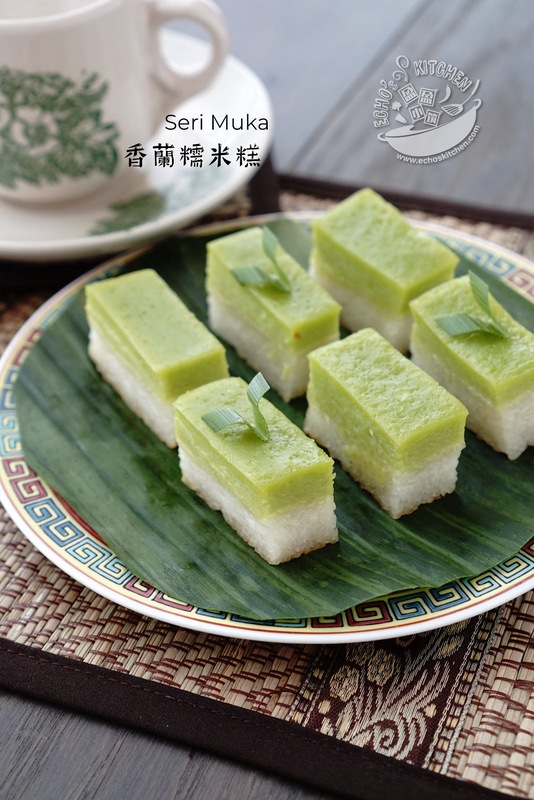 It has tasty fillings of sugar, peanuts and creamy sweet corn. This lovely pancake is normally found in night market (Pasar Malam) or morning market (Pasar Pagi), sold by small stalls with 3-4 copper pans lined up baking this yummy pancake slowly to perfection, each one has thin layer of crust, and creamy fillings. I just couldn't resist a piece each time I passed by the stalls! The name of this bread is confusing enough, not to mentioned making it.... anyway, I planned this bread initially to make use of the left over rice in my fridge before a long trip out for work. Later on I found half a packet of sesame powder I bought earlier to make sesame porridge, I decided to bring my bread a notch healthier by adding that and some oat meal powder! The rice in this recipe retain moist well, and make the bread very soft and fluffy! Seri Muka is one very interesting Nyonya kuih. It is sweet and salty in taste, chewy and silky in texture, even the top and bottom colors shout contrast. But it all worked out well with the blend of coconut milk, in typical South East Asian style : different, yet harmony. So I decided to attempt this laborious dish at home. I started by patiently saving all prawn shells and heads every time I cook a prawn dish. I also sent out request to all my friends in NJ to save up their prawn head and shells for me! 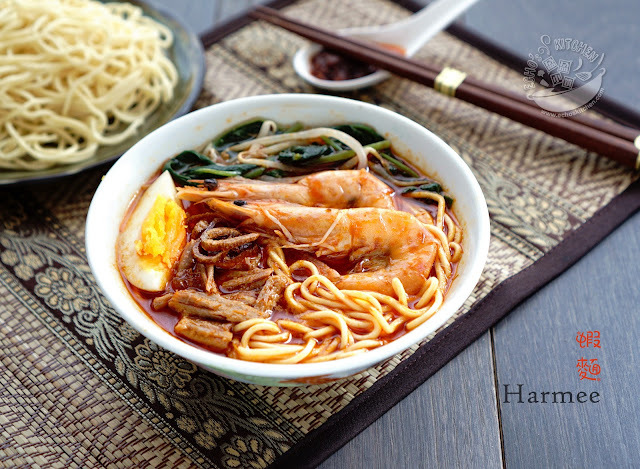 As a result to our group effort.I manage to make this delicious prawn noodle for lunch today! Saffron is believed to have good medicinal properties since ancient time. 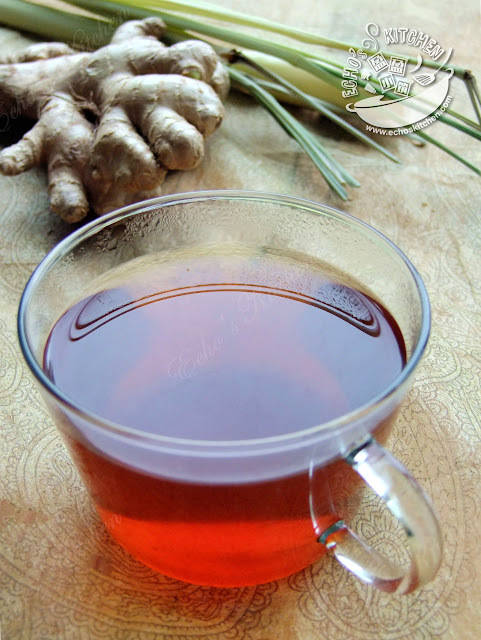 The Chinese use it to help women regulating menstruation cycle, improve blood circulation, help remove blood clots/blue black. It is also important to know that saffron is not advisable to use on pregnant lady and or during menstruation, as it could cause excessive bleeding, and possible miscarriage. This saffron rice works well as a side dish to go with fish or any seafood, it could be prepared in under 20 minutes! The kind of steamed buns we have back in Malaysia are very different in taste compared to those we found in the Asian supermarket here. Our "Pau" (Steamed buns) back home looks similar in shape, but the wrapping tasted much sweeter, almost like a sweet bread. Since the Malaysian version is not available here, I decided to make it at home to satisfy my homesick taste buds! I planted a cow horn chili plant last spring and it was obviously a late bloomer, it started flowering very much at the end of summer, and didn't gave me as many chili as I may wish for to make chili pickle. It is also way too cold to make Indian pickle now, as it need long hours of sunshine to dry up chilies, one crucial factor in pickling process. Anyways, one can never have too many chili at home,especially fresh crunchy green chili... I made it with good old shredded chicken breast, it's delicious and quick! 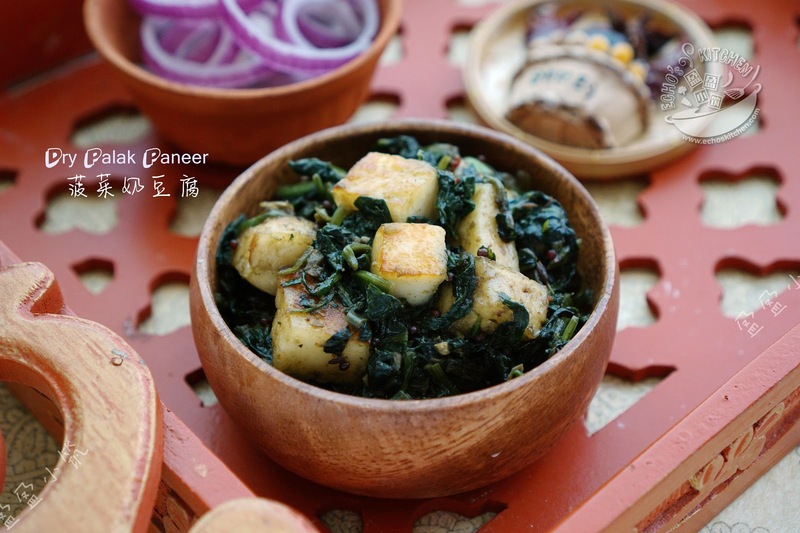 Paneer is a type of fresh cheese common in South Asia, it is an acid-set farmer cheese made by curdling milk with lemon juice or any type of food acid. A very good source of protein and calcium for vegetarian, could be made into many delicious dishes. Palak Paneer is one of them. I personally like my spinach in this dish in chunk, many recipe asked to puree it, won't change much of the taste, only visual and a little different in texture, perhaps. I used to packed my lunch box (Fan Hup) from the hawker stall that sell mixed rice (Zap Fan), meaning mix dishes with rice, the hawker will hand you half a box of white rice and you could choose any type of dishes normally consist of all sort of home cook-liked dishes. Its economical, and very comforting food.... indeed. I have planted a cucumber plant this summer with this crunchy yummy pickle in mind. I had been eating my harvest as salad or juicing them so far! Here it comes the end of planting season and I find myself with the very last 3 cucumbers I picked from my garden. I will have to wait for one year if I don't make this pickle now! Legend has it that this almond milk was the beauty secret used by all concubines at the Imperial palace in ancient China. It is also recorded in Chinese Medicine book that almond could help in skincare, lung care (to prevent cough and asthma) and its rich fiber could also help prevent constipation and will help reducing cholesterol! 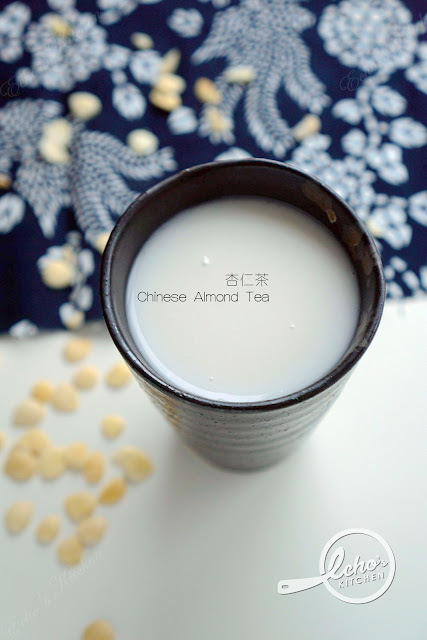 Note: The almonds used here is different than the almond we snack on, the two type of almonds I used for this milk could be found in Chinese/Asian supermarket or Chinese medicine shop, it is mostly used in medicine/soup in Chinese culinary. 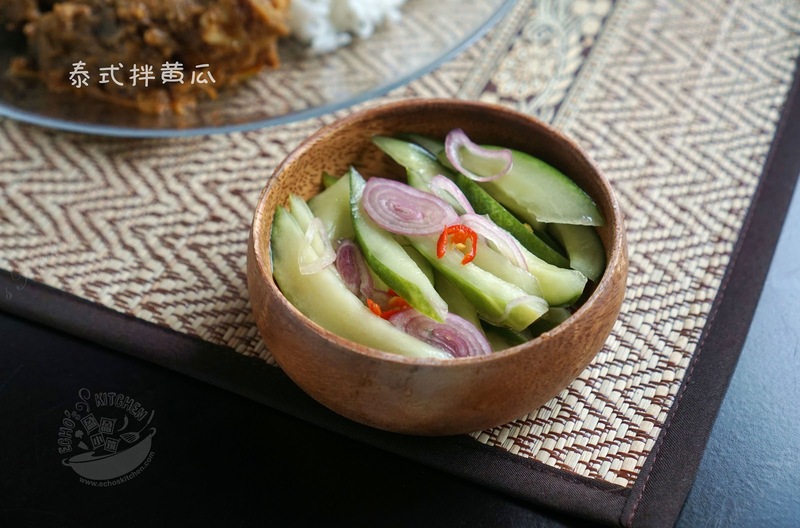 This is a very typical Malay dish, savory, rich in flavor and goes well with steam rice. 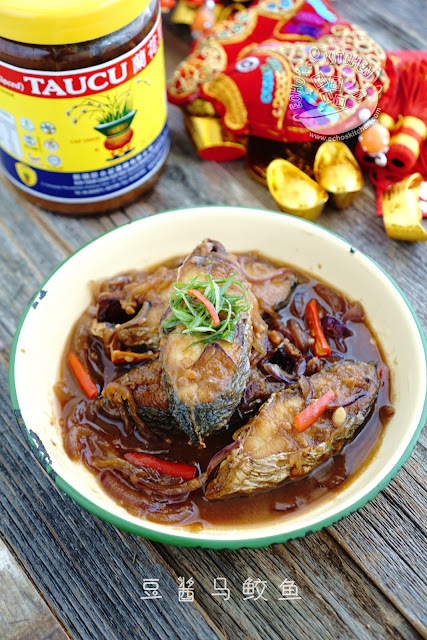 It is better to make with sea fish, Mackerel was the first choice for many Malaysian, and pomfret works well too! 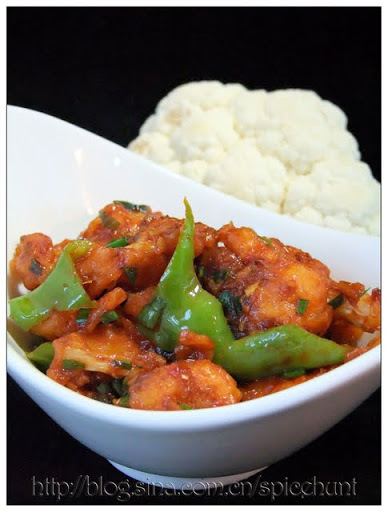 Paneer, a type of Indian Cottage cheese is a very good source of protein, and well loved by Indian. This paratha stuffed with spiced Paneer, made it a well blend of protein and carbohydrate, thus a good breakfast choice! Aloo Poha is a well loved breakfast in India, Pakistan and Nepal. Poha is a type of flattened rice, it is very easy to prepare this type of rice, all you need to do is to wash and briefly soak it with water, it will then swollen up, and could be cooked in a very short time. A very good choice for busy morning indeed! Avocado is truly a nutrition powerhouse, it is especially rich in Vitamin E, which is great to help in delay aging, also make your skin, hair and nail glow! It's rich monounsaturated fat could also help to keep cholesterol level in check, which help to prevent all sort of cardiovascular diseases. Since the weather is getting colder and dryer by the day, a glass of silky avocado milkshake not only is a good breakfast choice, it also help to keep your skin moist and body healthy! Curry puff is a very hearty snacks for me, I am still living in the world of 3 curry puffs for a Ringgit (Malaysian Currency). I was surprised to see the price AND reduced size curry puff at the road side stall last time when I visited Malaysia. It was just costing a lot more, at much smaller portion! Talking about inflation huh! It make sense to make it at home... I guess. As I do not fry much, I decided to come up with a baked version of Curry Puff, the shell is somewhat different in texture, still tasty nonetheless. This simple recipe is so simple that I couldn't believe it delivers such a brilliant taste! The best part about it? It doesn't stink the kitchen like any other fish recipe! 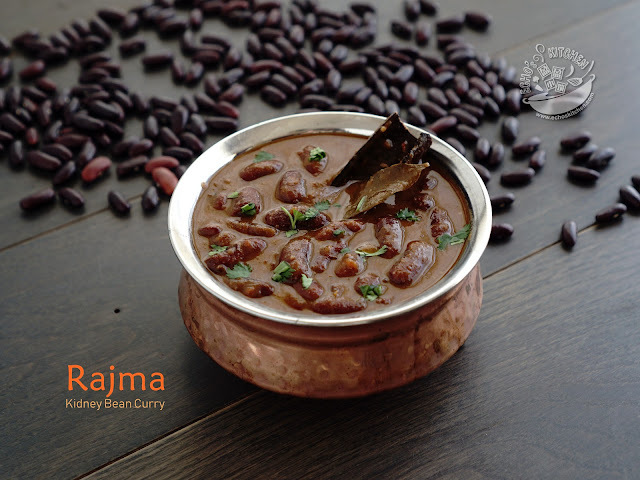 Perfect for winter cooking, it's warm, it's spicy, it's delicious...... Couldn't ask for more! These stuffed Vegetable/Tofu has a very interesting name. 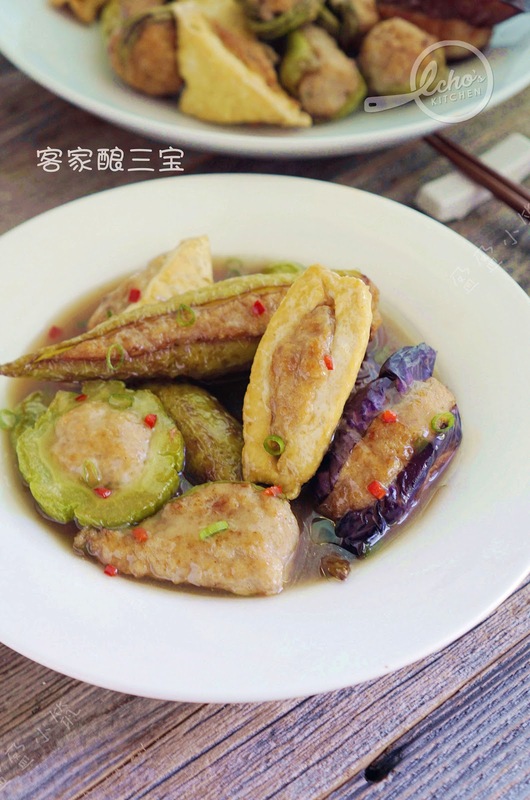 Whatever you choose to make this dish with, it is called "Yong Tau Foo" （Literally means Stuffed Tofu) in Malaysia ! And you could stuff basically any vegetables or bean curd products that you could think of. This Keema Curry is a Pakistani dish that I learnt from a friend, it is less spicy compared to most of the other type of curries, suitable for those who likes curries and can't take too much spiciness. It is normally made with minced beef or mutton, I used minced turkey in my recipe and it still taste stunning! You just gotta try it! Seremban is the capital of state of Negeri Sembilan in Malaysia, this Baked Pau was initially made famous in a area name Rahang in Seremban, and eventually became the favourite pastry/snacks for all Malaysian. I used to buy a box of this famous pastry whenever I have to travel long distant, its a very convenient snack and does not require heating. I have been wanting to make this once at home since I can't get this anywhere in the States... So I did! 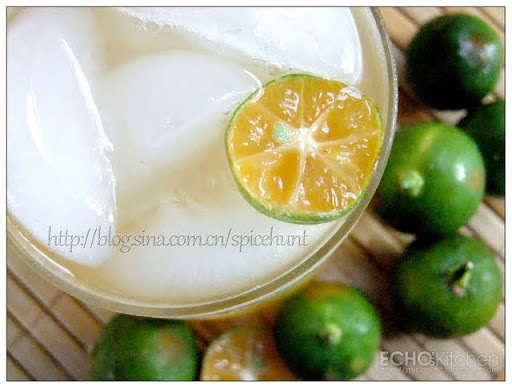 Calamansi/Limau Kasturi Juice was a very refreshing beverage found only in the south east asia. This particular citrus fruit is a very useful ingredient in the house. It could be use in cooking, season for soup, make into dipping sauce, salad dressing, beverage，cocktail,it is also a natural cleanser/deodorizer, we use this to clean our hand after cutting/cleaning fish! Since it's Mooncake festival today, and I had way too many Mooncake... its time to have this refreshing drink to help digest! During my years in India, I often encountered a question that I could not answer until much later. The question goes : "Can you teach me how to make Gobi Manchurian, the CHINESE FOOD ?" Oh yes, you heard it right, a Chinese dish that no Chinese ever heard forget eating back home in China. It is a dish that surely show up on the menu of any Chinese restaurant in India. A dish took me a long time to figure out what it is. Longer time to explain to my Indian friends that Gobi Manchurian is NOT a Chinese dish, and Manchu is NOT a state in China, it refers to the tri-states area up north in China in ancient time, the term Manchu is no longer in use geographically nowadays, Manchurian now refers to one ethnic group in China, and we find no trace of this dish in the Manchu's recipes...."
I could only imagine now that this delicious Indian-Chinese dish was created long back by some well-wished Chinese chef try to make a dish that suits the local taste buds with some local ingredients. 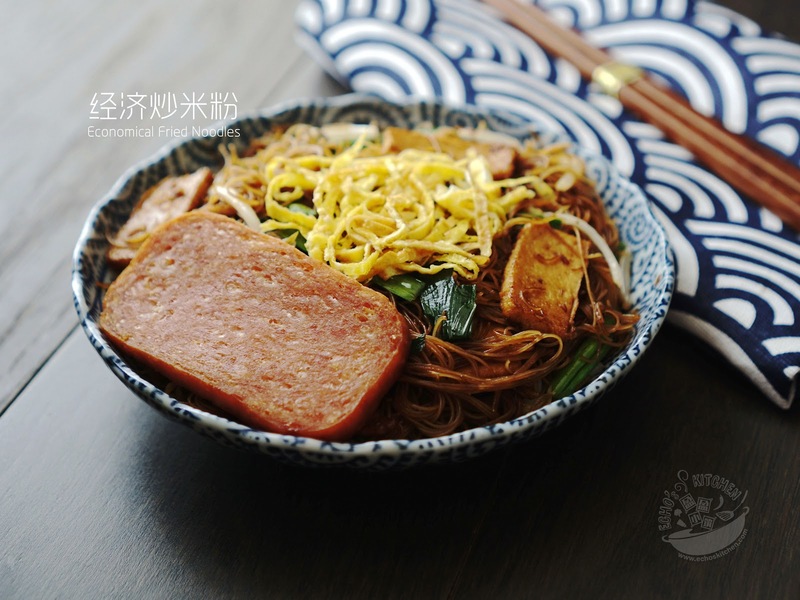 It probably is a derivation from the the famous sweet and sour pork dish name guobaorou "锅包肉” from the northern part of China, Just a vegetarian version, with quite a number of modifications! 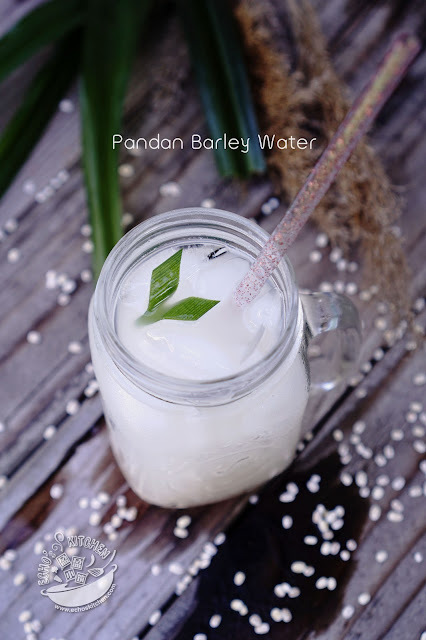 It is normally made with screw pine leaves/Pandan leaves to give a sweet distinctive smell to the already very nice and creamy flavor of barley. It is very hard to find fresh screw pine leaves here in the States. Last week when I was traveling for work in Arizona, I paid a visit to a close friend, she show me around and I saw fresh Pandan leaves sold in the Asian supermarket. I was elated and waste no time to bring one packet home! The Chinese traditional herb and medicine also believed that barley could help to reduce weight, cure water retention, is a good source of fibre, and could help to whiten skin tone. If used for long term, could also help to prevent freckles and wrinkles! Talking about home-made skincare huh! 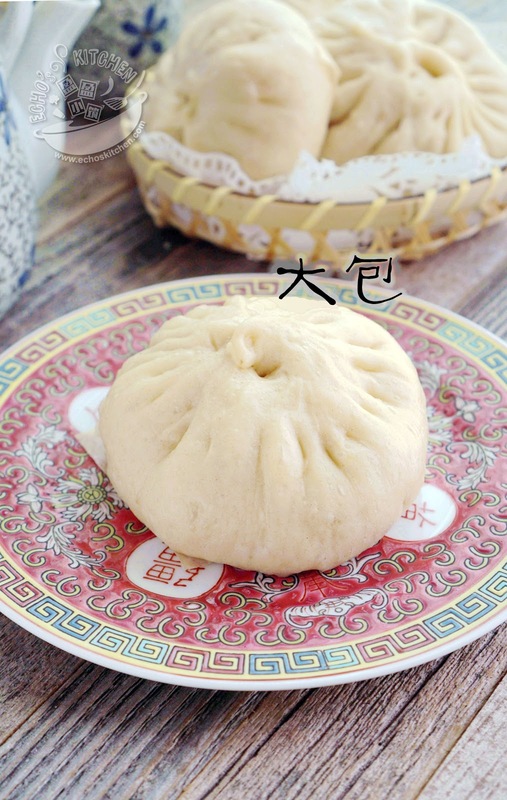 A friend of mine posted his grand mother's recipe of this traditional Beijing pastry in a forum that I often. Though I never have this pastry before and have absolutely no idea how it (should) taste. I decided to give it a try. The original recipe posted by my friend was without precise measurement, like his grandmother, he too goes by gut feeling. So I decided to come up with my version of measurement for record sake.